When clients are looking for something other than a standard folder to house their internal documentation, Kolorco are ideally qualified and have 25 years of experience in producing our client’s creative ideas. This project was printed full colour onto Curious Metallics Ice White 120gsm to the outer with a tightly registered gloss silver foil to one side to give the folders a high-quality finish. The Inner prints in an overall blue wash using 4 colour process onto Vision Superior 120gsm. Both sheets were then mounted to 3000micron grey board and multicreased to create a spine which enabled A4 sheets to be inserted. 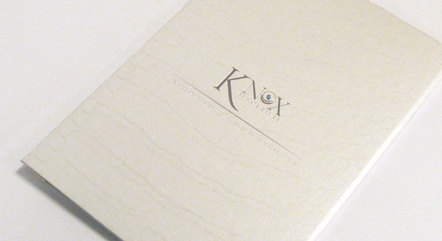 These sheets were held by 2 personalised binding screws which have been etched with the client’s logo. If you would like to see samples of this type of work please call Kolorco on 01274 613566. Print Shop by Kolorco is the online shop for Kolorco print based in Bradford, England. We have been trading in traditional print for over 25 years and are extending our direct to consumer HP Indigo® digital printing range. Here you will find a range our most popular products available to be ordered direct, all you have to do is upload your artwork and make your customisable selections and your artwork will be printed and delivered before you know it!